There are variety of models from the leading headphone manufacturer Plantronics and while each user is now really aware of How To Pair Your Plantronics headphones? Again problem here is to identify which Plantronics headphones model you own, what type and what is the process. Its really difficult to find it out. Okay, you don’t know which Plantronics headphone model you own, still want to get Bluetooth paring? No issues this simple guide will help you quickly. Even though you are not aware which is model number, it is easy to see what type of control buttons your headphones have? Once you check which category your headphones falls into, go ahead and follow below step by step instructions for pairing your headphones with your smart phone using Bluetooth settings. Note : If you own really old legacy or obsolete headphone model from Plantronics, then these methods may not work in that case please refer to last section of this article or contact me. Step-1) You can start with your headset powered OFF and locating the Center Power/Control button. Step-2) Press and Hold the call Control/Power button for 5 or 6 seconds until you hear “pairing” and the light starts flashing an alternating red-blue (the Discovery 975 flashes an alternating red-white) – See above info-graphics for more clarity. Step-3) Now you can release the button and keep the headphone aside. Step-4) Activate Bluetooth ® on your phone and search for new devices. Follow the pairing instructions for your cell phone or other Bluetooth device. Step-5) If your phone asks for password then enter 0000 (four zeros) to complete the pairing process. Some phones may not ask for any authentication, I mean no password. That’s perfectly fine, go ahead and complete the pairing process. Step-6) Once successfully paired, you will get confirmation voice prompt as “pairing successful” and the LED indicator light stops flashing. 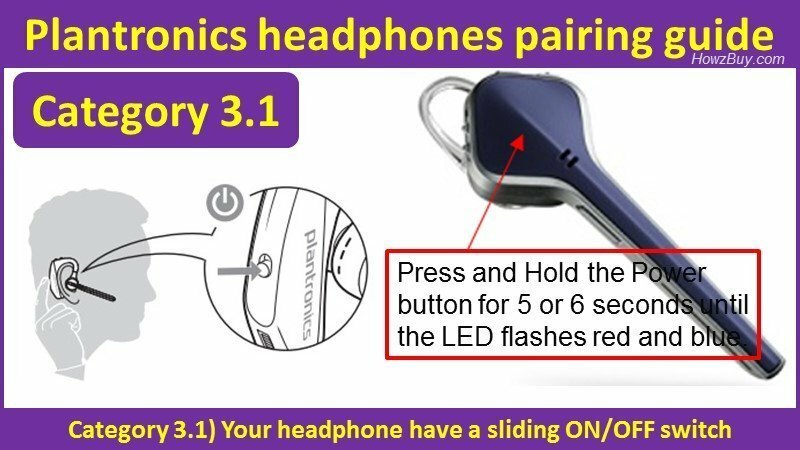 Step-1) Locate the ON/OFF/Pairing button on your headphone, see image above for guidance. Step-2) Now Press and Hold the Power switch towards the Bluetooth icon until you hear “pairing” and simultaneously the headset LED’s will flash red and blue. This step puts your headset in pair mode. Step-3) Now release the button and keep the headphones aside. Step-5) When you see headphone in list, click to connect and pair with phone. Some phones do ask for password, in that case simply enter 0000 (four zeros) to authenticate the headphone to smart phone. Step-6) After successful pairing the headset LED’s will stop flashing and you will hear voice prompt “pairing successful”. You are done and ready. Step-2) Now Press and Hold the Power button for 5 to 6 seconds or until the light starts flashing an alternating red-blue. Step-3) Release the Power button and keep the headphone aside. Step-4) On your mobile phone switch on Bluetooth. from the Bluetooth menu search for (or add) a device. The smartphone shall show your headphone in list of devices. Click to select and pair. Step-5) If the smartphone asks for password, use 0000 (four zeros) as password and the device shall get paired. Some phones may not ask for password, that is perfectly fine. The procedure for pairing is exactly same as category 3) so you can simply refer the section above this image, only details shown so that you don’t get confused in between on/off button versus on/off sliding switch. Basic method remains the same. How to Pair the headphones with one more smartphone or Bluetooth device? So to pair one more smartphone with your headphones, follow the same procedure for each mode enlisted above. And you are done connecting second device.